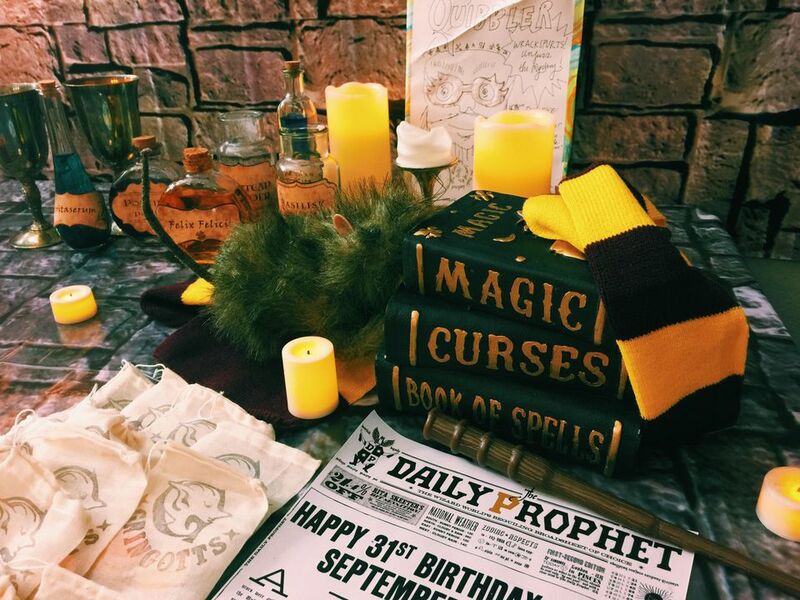 Grab your spell books and press your dress robes, we have everything you need to magically transform your space into Hogwarts for the ultimate Harry Potter party. Whether it’s warm enough to celebrate outdoors or you’re looking to transform the inside of your home into The Great Hall, we created our own Room of Requirement to be your guide–full of essential recipes, decor, and activities that even a Muggle can do! Continue to 2 of 23 below. HP Wishlist / Warner Bros.
We’re pleased to inform you of this foolproof party invitation DIY. Grab your calligraphy pen for a more authentic take on this classic letter or download a template for easy customization. When you’re ready, send your invites out with an owl for a magically fast delivery. Continue to 3 of 23 below. Include a Hogwarts Express ticket for your guests to hang on their fridge, so they don’t forget the time and place of your gathering. Want to stay true to the story? The train leaves at precisely 11 o’clock from Platform 9 ¾! Continue to 4 of 23 below. If you want to trick your friends before the fun begins, send them a personalized howler in lieu of a traditional invitation. Include a joke or two about some recent misbehavior as a nod to Mrs. Weasley’s magical letter. Continue to 5 of 23 below. Create a cozy outdoor or indoor space with a long table fit to sit all witches and wizards in attendance. You can conjure up a Great Hall-inspired look by setting up buffet-style tables in your space. Have a separate table decorated for each Hogwarts house, like Kara Allen from Kara's Party Ideas, or divide one large table with different colored decor depending on the size of your space. Scatter DIY potion bottles filled with seasonings and sauces for the perfect reusable decor. Continue to 6 of 23 below. Bring the party outside for this Forbidden Forest-themed fest. Turn one of your backyard trees into the Weeping Willow to guide your guests to the out-of-bounds location. Cover your table and chairs with artificial vines and get some help from Neville or Professor Sprout to conjure up potted Mandrakes or other magical plants for your centerpiece. Just watch out for Centaurs any dark-hooded figures–you never know what could be lurking beyond the Hogwarts grounds. Continue to 7 of 23 below. For a more lively atmosphere, transform your space into its very own Three Broomsticks or Honeydukes. After mastering the cozy, vibrant decor of each shop, don’t forget to serve up butterbeer and your favorite candies. Continue to 8 of 23 below. There are many different desserts you can bake to end your magical night on a sweet note. Stick to the books with classic staples such as Harry’s 11th birthday cake from Hagrid, chocolate frogs, chocolate lava “cauldron cake,” Professor Lupin’s anti-dementor chocolate bars and even a take on sherbet lemon–we just can’t promise they’ll get you into Dumbledore’s office. Hide these Golden Snitch Ferrero Rocher chocolates or Golden Snitch cake pops around your home so the winning Seeker snatches a delicious reward. Continue to 9 of 23 below. Get your Hogsmeade permission slip signed and head over to the Three Broomsticks for a glass of classic Butterbeer, firewhiskey or pumpkin juice. Or get inspired by Snape’s class with these potion inspired cocktails: polyjuice potion and felix felicis. Want drinks with more of a punch? The Goblet of Fire, Mad Eye Martini, and Pensive Cocktail are perfect to make in large batches. Just make sure you have a Wolfsbane Shot on hand in case Lupin shows up during a full moon. Continue to 10 of 23 below. Objects at Hogwarts are all about the enchantments. Whatever theme you choose, add a magic touch with floating candles and constellations above your table setting. In addition to the candles and stars, add paper snowflakes or leaves depending on the season. Want to add more subtle touches to your home? Display your favorite magical novels as floating bookshelves and even add green floo powder flames or flying letters to your mantle or fireplace. Continue to 11 of 23 below. Transform your stairs into an amazing gallery wall full of moving or still portraits taken right off the screen. Bryton Taylor from In Literature created a wonderful wall for her Harry Potter themed party. Print off your favorite portraits from the movies or search an antique store for old-timey portraits to help set the stage. Continue to 12 of 23 below. With their ticket in hand, your guests can reach the Hogwarts Express right from your front door. Print out one of these Hogwarts Express signs and hang on your mailbox or front of your home. Drape a brick wall-inspired sheet on your front door and have your guests magically enter your fête. Want to decorate more doors? Try enchanting your entrance to the basement as the Dungeons or recreate the Fat Lady portrait for a Gryffindor common room entrance on one of your bedroom doors. Continue to 13 of 23 below. Pay attention to details with these animal-inspired crafts. Make your own Monster Book of Monsters to display around your party–just don’t feed it any cockroach clusters. If you’re looking for something less frightening, you won’t have to go to Weasley’s Wizard Wheezes for this fluffy creature. These adorably fluffy Pygmy Puffs are perfect for your younger guests. Continue to 14 of 23 below. If pumpkins are in season, it’s the perfect time to practice your Transfiguration charm and conjure up some critters. From Hedwig and Crookshanks and even Padfoot, these pumpkin designs will inspire you to recreate your favorite animals from the books or films. Continue to 15 of 23 below. 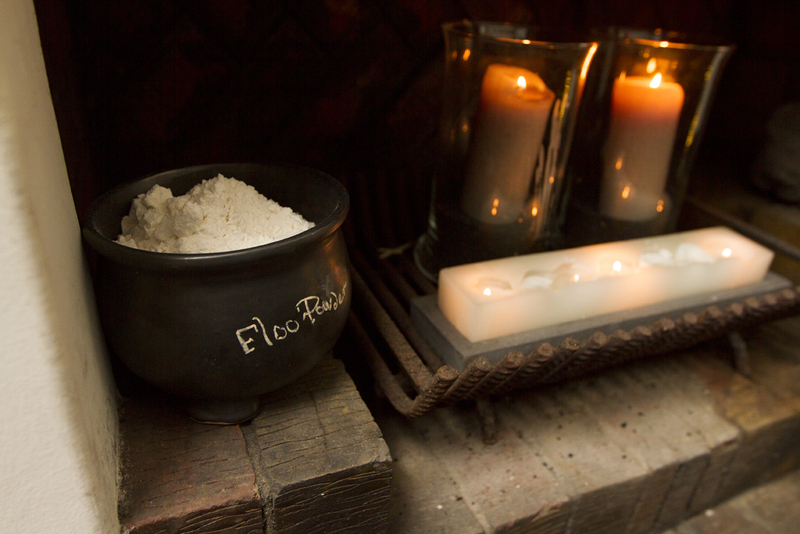 Turn to page 394 and head down to the Dungeons for this potions-inspired craft. With minimal ingredients, this project can be easy even for first-years to practice their new magical powers. Want a more hands-on craft? We love this DIY potion “slime”. If you want to stay true to Professor Snape’s potions classroom, we love this beautiful tutorial from In Literature and these printable ingredient labels from PB Teen. Continue to 16 of 23 below. Whatever the theme, make your table extra special with spellbook centerpieces or crocheted cozies Molly Weasley would love. Accent your space with potion bottles for your cocktails and different colored placemats and/or tablecloths for the different Hogwarts houses. Continue to 17 of 23 below. The decor doesn’t stop in your living space, keep the magic going in this unexpected place. Stick a decal to mark the Ministry of Magic entrance on your toilet, like Kara from Kara's Party Ideas did. Or if you’re feeling extra ghoulish, place a cutout of Moaning Myrtle in your bath or shower and follow this tutorial on how to create your own motion​-sensored “haunting." Need more magic? It won’t be a Hogwarts bathroom without “The Chamber of Secrets has been opened enemies of the heir... beware” written on your mirror. Continue to 18 of 23 below. Play any of your favorite Harry Potter soundtracks or even a Wizard Rock song or two to create the perfect ambiance for guests. After a few drinks and great food, people will be “Dancing the Hippogriff” at the Yule Ball in no time. Continue to 19 of 23 below. It isn’t a party without a few games. Set up a game of DIY Quidditch with hula hoops and brooms in your backyard for active fun for all ages. Want to keep the fun indoors? Ron’s favorite round of Wizard's Chess is perfect for a cozy night in. Continue to 20 of 23 below. Let the wands choose your witches and wizards with these beautiful easy DIY wands. Make the wands in advance and have an Ollivander's-inspired event or accio the supplies and have your guests make their own unique wand. Continue to 21 of 23 below. No Harry Potter party is complete without a classic Sorting Ceremony. Make your own paper maché Sorting Hat and invite your guests to the front of the Great Hall to determine their place for the rest of the party. Continue to 22 of 23 below. Don’t forget to dress the part! From traditional Hogwarts robes to cosplaying your favorite students, professors or creatures, the possibilities are endless for you and your guests. Need inspiration? These costume ideas from Bookbub are so good, these wizards must have taken some polyjuice potion! Continue to 23 of 23 below. Don’t let your guests leave without a bit of magic to bring home. Fill a printable Bertie Bott’s Every Flavored Beans-inspired box with a medley of candies or a Honeydukes Chocolate Frog. Or personalize your guests’ favorite Harry Potter memories with pillow boxes of their favorite characters or a crocheted bookmark representing their Hogwarts house. How Much Alcohol Does My Party Need?